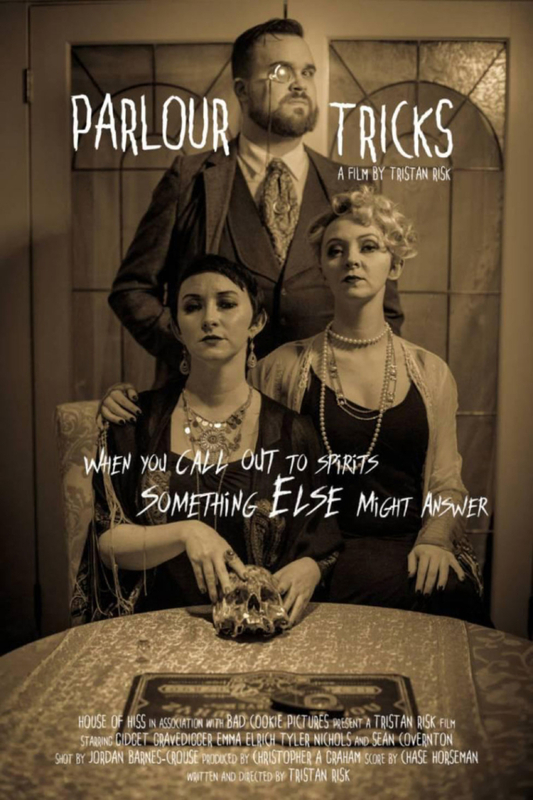 If you’re looking for a fresh, fun, lighthearted horror bit that’s right for all ages, then Tristan Risk’s “Parlour Tricks” is just for you. Tristan Risk recently added ‘director’ to her ever-growing resume, and I have to say, I absolutely agree that it belongs there. It’s no secret that Risk is a jack-of-all trades, and is known for her other work as an actress (American Mary, Aliens Ate My Homework, Innsmouth), burlesque dancer (Caravan of Creeps), model, snake mommy, writer, producer and now director. I had the immense honor of viewing her directorial debut, Parlour Tricks. Parlour Tricks, produced in a joint effort with House of Hiss and Bad Cookie Pictures, is everything you’d expect from Tristan Risk — whimsy, horror, laughs and creativity. But it is also family friendly, which isn’t something I would usually associate with Risk. The short film, which runs just over seven minutes and is shot entirely in black and white, is all about a seance gone wrong. 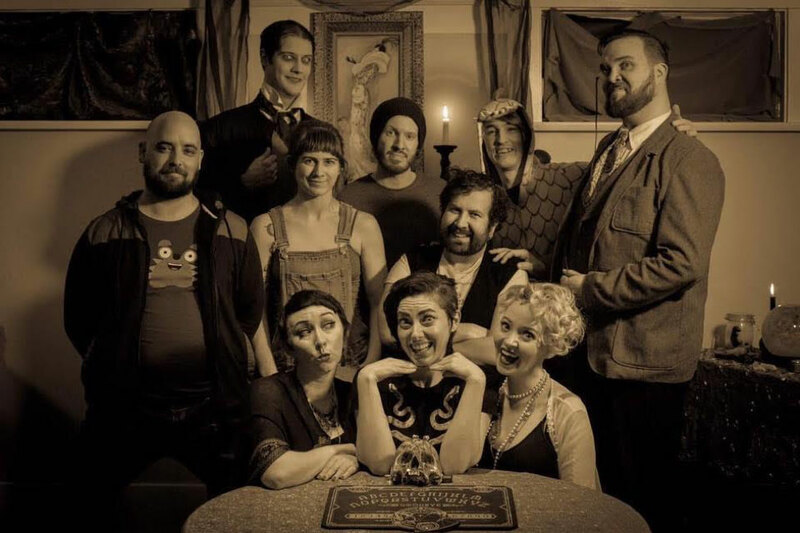 Shot in just one location, a small but talented cast of characters (made up of the well-known Vancouver performers Gidget Gravedigger, Emma Eldritch, Tyler Nichols and Sean Coventon) convene at a seance to summon the spirit of a lost, wealthy relative who passed in a tragic (and questionable) accident. The unlikable relatives of the deceased have gathered to learn the whereabouts of the will and determine who among them should inherit the estate. 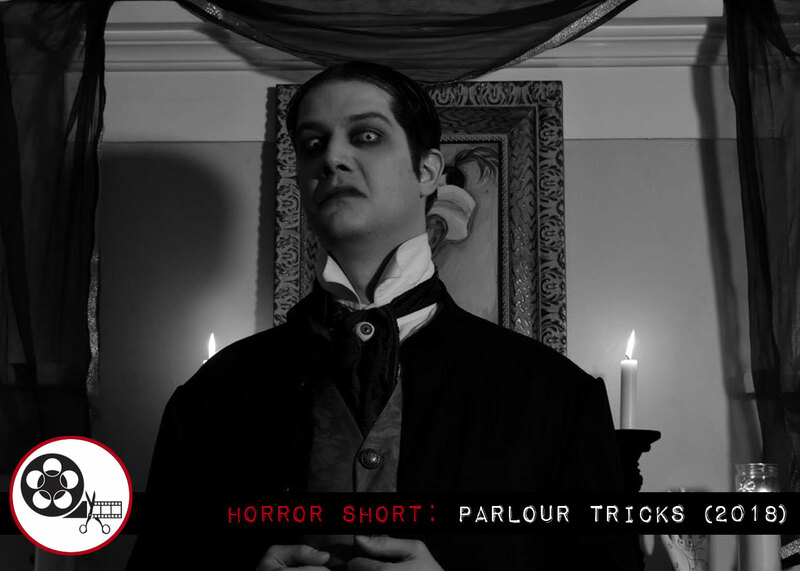 Parlour Tricks has no shortage of laughs and gasps, all culminating in a shocking ending that you won’t see coming. Parlour Tricks is backed with a fun, playful score by Kris Wood and excellent cinematography by Jordan Barnes-Crouse. Additional support was provided by Selena Raskin, Ben Gammound and Burns the Dragon. After seeing her impressive directorial debut, I cannot wait to see what else the talented Miss Risk has in store for us with her future endeavors. Be sure to catch the incredibly fun Parlour Tricks as it tours the festival circuit.